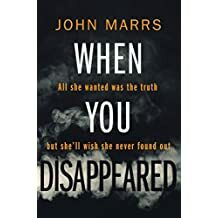 When you Disappeared is a gripping, jaw dropping thriller that will have you gasping in disbelief throughout the story! Simon, a husband, father, business man and “normal, run of the mill guy”, is probably a hundred guys you know yourself. But not really. Something caused Simon to leave one day with nothing but the clothes on his back. Why he left…you won’t believe. Even more than that, you won’t believe how his life unfolds because 25 years later, he shows up on the doorstep of everyone he left behind with an explanation that will blow you away! The author did a great job painting a picture of Simon as someone you almost felt sorry for…until a certain part in the book where you don’t feel like that so much! Without spoiling this story, I will just say, if you like books with many twists and edge of your seat events, this might be a great read for you. Simon could very well be any man you meet in daily life but by no means is he the man you want to cross paths with!!! We listened to this story on audible. It was engaging and fast paced. We gave it 4.5 stars!